The score as it now exists is thus one expression of a field which could, theoretically, have produced quite a different set of results entirely. The title of the piece reflects this openness, the protean quality of my frame of reference. The work is structured in three sections, demarcated by cadenzas. The first and last sections are similar in character (Ferneyhough describes the latter as a “reworking” of the former), projecting a muscular ebb and flow between multiple overlapping strands, all vying for attention, and calmer passages where the ensemble is much more homogeneous. The argument has often been made over the years that (particularly when bogged down in bellicose critiques of his notational stance) one tends to lose sight of the powerfully expressive voice at the heart of Ferneyhough’s music, and this aspect is particularly striking in Prometheus. There’s much to the melodic writing that’s forceful, bullish even (the work arises from staccato attacks, which seem to have a lasting effect on subsequent material), but as both sections progress the tendency is towards slowing and quietening, the instruments becoming increasingly lyrical as they do so. Both the central section and the cadenzas that surround it—for clarinet and piccolo respectively—are brief; the latter cadenza is very lovely, much more sedate than that of the clarinet but with occasional loud grace notes and flurries, building to an eye-watering climax. 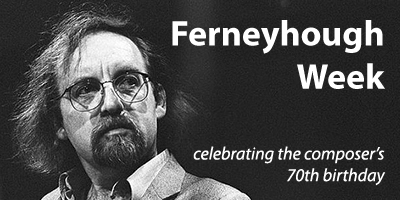 Overall, the energy unleashed in the wildly polyphonic passages is impressive, but it’s the delicacy that makes the deepest impact; much of the final section—particularly the curiously oblique ‘chorale’ that prefigures the ending, and the beautiful, soft, drawn-out music that follows—may well surprise listeners better acquainted with Ferneyhough’s more recent works. Broadcast in August 2012, this performance took place at an afternoon Proms concert from Cadogan Hall, performed by the Britten Sinfonia conducted by Clark Rundell. My review of the rest of the concert can be found here.